March is National Reading Month and to celebrate we are giving away an all-new Kindle Paperwhite, Waterproof eReader, 6″ with 8 GB of storage to one lucky winner! You can use it to download any books of your choice and even enjoy our Winter book club recommendations. The thinnest, lightest Kindle Paperwhite yet, with a sleek, modern design so you can read comfortably for hours. Features our signature 300 ppi, glare-free Paperwhite display, printed-quality text and twice the storage of the previous generation. Plus a single battery charge lasts weeks, not hours. With the all-new waterproof Kindle Paperwhite, you’re free to read and relax in more places, including the beach, pool or bath. Paperwhite is IPX8 rated to protect against accidental immersion in up to two metres of fresh water for up to 60 minutes. All-new Kindle Paperwhite – Now waterproof and twice the storage. Now waterproof (IPX8), so you’re free to read and relax at the beach, by the pool or in the bath. Low prices and massive selection: over 5.5 million books including latest bestsellers, Kindle exclusives and more. I would love a Kindle, so convenient! Would love to have a Kindle as it so much more convenient to take on holiday than several paper back books. I need a new kindle, as my old one is very old, and does not do all the things new ones do. I love my kindle but like me it is old and slow and in need of an update! It would be very nice to win a new one, pity there is not a new version of me to go with it! I would love to win a kindle I had one which my husband has now taken over and as an avid reader I have filled my bookcase to bursting point !!! Would love this. I am an avid reader & I am getting too old to lug armfuls of books around when I go away. Also so many exciting books are on ebooks. My birthday this week so would be nice to win this. I bought my kindle in 2012 hence it has done well but is definitely due for retirement. A new paper white would ‘lighten ‘ my reading experience. I got a present of a Kindle but it went 'walkies' with one of my offspring & never returned! My family bought mine for my birthday some years ago but given up the ghost now, I really miss it books hurt the hands. I’m still on the books! Didn’t think I’d ever want a kindle, but am turning! Be great when going away. Love Silversurfers, make s me chuckle. Would love a Kindle, I read so much. Would love a new kindle. Mine getting old just like me! I have a Kobo - on it's last legs - love reading, my mum taught me to read when I was four years old!! Love my old kindle, but, would also love an update. Never had a kindle but would love to win this, will make me sit and find time to read again. Never used a Kindle and as we travel a lot would love to try one. My original kindle is years old and would love an upto date one. Hi Melanie, my daughter has the same problem, she loves to read her Kindle e-reader in her bath. Because she was terrified of dropping it into the water I had a hunt online and found a specifically designed waterproof bag, or 'pocket' to protect a Kindle reader from an unexpected dunking! It has a double deal on it but all the controls can still be used, and the screen is still perfectly viewable. If you don't win the draw, you might want to have a look for something similar. Would make a great present for my book worm wife! My kindle is the first model, needs a light to read it, this will be a great replacement. Rather hooked on silver surfers! Would love to win as I like reading and travelling so would be much more convenient than taking several books! I love your comedy posts on Facebook, really brightens up my day! Would love a Kindle that actually had its own light. Love my old one, but it's starting to look a bit jaded now! Would love to win this. My kindle needs updated. Fantastic prize. Tried to reject e-readers because I love paperbacks. I failed and now have too many books on my phone. This would be a treasure. Great for the modern reader. Sounds like a “must take” for holiday reading. Can’t wait! Won't go on holiday without y Kindle, although it is quite a few years old now. Could do with an updated one. So practical if going on holiday. I think I'm nearly there. I've always been a real book reader, but now may be the time to switch to ebooks! I'd love a Kindle white, my old original Kindle is jam packed and the buttons are playing up so not sure how much use it will take. I have a pile of books on hand just in case it dies! would love to win one, all my friends use them whilst travelling, would like to be in with the in crowd!!! I love reading and would really enjoy having a library on the go! Thank you for the chance to enter your prize draw to win a kindle paper white , I have had one for years and always use it to read books and take on holiday , but I am afraid it’s starting to go slow now and the battery does not last as long. So here’s hoping I am lucky enough to win it. would love one of these for my mum who has eyesight problems and can no longer read books - would give it to her for mother's day if i won. Would love one of these, the sum plays havoc with my iPad. If you knew how many times my mobiles been in water you'd realise that I need this! I have just purchased the book "Becoming Michelle Obama" wold have been so much lighter to hold if I had this kindle e reader. I would love to win this as my old one is starting to play up and not holding it's battery charge. Fingers crossed. Laid up up with severe back pain, fed up with tv..can’t even get to shops to get a new Book! This would be especially great to take when travelling. It would keep you occupied on the journey there and back and also allow you to read whilst away. I can just imagine sitting in the sun with a cold drink and a good book. Don’t have a Kindle, would love to have a Kindle, so convenient for holidays. paperwhite as it will be like reading a book. Great to take on holiday,read in bed or pop into your bag for those spare moments on a bus or in a park. I have a very old , much loved first edition Kindle ,to upgrade would be fantastic. A kindle is such a great saver of space. A much more practical way of reading before bedtime ! Superb chance to win a dream prize of mine. I would so love a Kindle. Reading is my my guilty pleasure.kindle gives me that joy. I could really do with a new kindle, my screen has got strange lines across it!! Wow - can actually read whilst having a bath. My old Kindle is showing it's age , so a new one to replace it would be very nice . I'm newly retired and I'd just love a fabulous Paper White to read in the garden in my new-found spare time please. Would love a new kindle as mine is old and cumbersome as it is in a case with a light thus also has batteries etc.But I now think that I would donate it to voluntary care team in my village to pass it on to someone in need. Would love a kindle had one a long while ago but it gave up so fingers crossed. Would love this - Never had a kindle. My old Kindle is on the way out ... I’d love a new one to catch up on the books in my library. Perfect for taking on holiday or just reading in bed. Nice and light for holding instead of a book. Brilliant prize, good luck everyone. Great prize for mothers day. I won a Kindle several years ago in a competition and it is still going strong. It would be interesting to see the improvements made to performance. I love to read in bed however it can be a little difficult when the lights fading. With the kindle paper white you can read in the dark. Great. Would love this. Save carrying heavy books on holiday. I would love this kindle. Ooh, my 2nd generation Kindle is quite elderly now, and this would be an ideal prize to win to take on holiday & read by the pool. An avid reader, my current Kindle is no longer working. A replacement would be great. 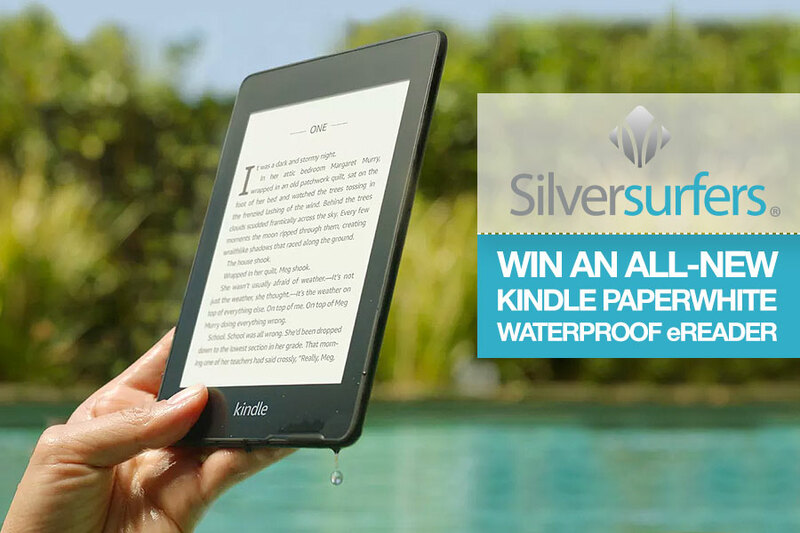 I would love to win a new waterproof kindle to replace my old one. Would make life a little easier! As I am using my retirement to travel a lot this would be amazing for all my holiday reading. I'm using my old Kindle at the moment, could desperately do with an up-grade..
Love books but Kindles are so easy to travel with. Love my kindle but it is way past its sell buy date! . Love reading - this would let me take unlimited books on holiday to enjoy. Fantastic prize. Entering competition for new kindle! I never go anywhere without my kindle. Luckily I've not dropped it in the pool yet. Just joined and am looking forward to chatting to people. I read loads, especially on holiday when a kindle is essential and it would be great to have a backlit one. I love to read great prize ! Easier than lugging books around ! Brilliant prize, great competition ! Waterproof, this means I can read safely in the bath. Great idea. At the moment i'm like a sponge ( no not wet and soft ) I just cannot stop soaking up information, Art, History, Astronomy, The Bible, Dante's Inferno, and now I've started reading clinical psychology what the heck is wrong with me. ( answers on a postcard please ) yes I would love the Kindle would save me a small fortune. A great prize, i am partially sighted so would be very useful. Would love this to take on holiday lighter than books. Please write your commwwents he..
My kindle is on its way out, so this would be a godsend. I've never had a Kindle but my husband loves his. I usually take at least 3 books away with me so at least if I won one I'd be able to take more clothes instead. Would be very handy for holidays. Would love a new kindle, mine is 1st Edition and battery is not very good anymore ! Great prize. I love reading and have longed for one of these for so long. Fingers crossed. Good luck everyone. I am an avid book reader and can’t possibly take enough reading material away any other way so Yes Please!! this is a really great prize for someone like me who has arthritic fingers, much easier to hold than a book. I have been an avid reader all my life & have yet to try a device. Not sure I can give up my books but this would be a great way to test ebooks! Something I have always wanted! . Would love to update my Kindle in time for my holiday. Would be a nice 60th Birthday present for myself. Light weight Kindle would fit nicely in my suitcase, for my holiday. An aid to my eyes, great. I used to have a kindle tablet which has long gone. I'd love to have a new light weight e reader! Would be great for travel and holidays. Being able to increase the font size may mean I won't have to take my reading glasses with me. Would love this,great for holiday reading,so fingers crossed. Would love to have one of these, it would be great for holidays and reading outside. I always wanted to have a new one of these as I have never been able to afford one. Nothing worse than getting your pages wet.....! Easy quick and a great competition. Yes please, I am an avid reader and would love a kindle paperwhite. I would love to win this prize as a treat to me for my 65th Birthday . Good luck everyone, I know I would love to win this fab prize. A good book, cup of tea, feet up, just for me! Enjoy read when & whare you please!! Perfect prize ! Good luck to everyone. As a visually impaired person, this would be a great help for me especially with the Audible ability added. great looking piece of kit !!!! Never had one so would be lovely to win one. I've never had a Kindle. To win one would be a wonderful experience. Love Kindle take on holidays and mine is just about to wear out had a long time. Would love a brand new shiny glare free model. Wonderful prize, would love one. A lovely prize for avid readers. It is a great prize for one Silver Surfer. would love this for my holiday. Looking forward to future chats. My Kindle is getting on in years, just like me! As I read every day and would love a new Kindle. Not been commenting for some time due to health problems sorry for not answering chats too, hope to be up and running soon! These are great. I really need a new one as mine was stolen 2 weeks ago and its just not the same using the phone ap. I would love this to give to my daughter. It's a shame that treading appears to be overlooked in many areas of society. It should be encouraged, both for information and also sheer enjoyment! So need a new Kindle. I had so many books downloaded that need reading. Would like this kindle as it is waterproof and more up to date than the other ones. The lovely and bright paperwhite, just the job on a tediously long flight! I Have a Kobo Box that is not working properly. I would love to win a Kindle. Haven't had a Kindle before but would love to win this prize and find out what everyone is raving about! I'm an avid reader and now I'm retired I have more time to indulge in my passion! Just love my kindle that I've had for years! Would be a great 60th birthday present for myself.. I would love to have a kindle paper white. Have had to give up my library visit as I can no longer see well enough to read even the large print and have been told the Kindle Paperwhite can change the size of text. So fingers crossed. Woud love to win this to repkace my old one. Perfect for holiday reading ! My kindle has broken Not the same using an iPad. My granddaughter loves books.....this would be ideal for her. Now that I’m retired, I have more time to enjoy real life. A kindle would be a brilliant addition to my ‘new’ life! Love my Kindle - take it everywhere with me - but it's not an up-to-date one. pages and I love to read. I love my kindle, it goes everywhere with me, even shopping just in case I stop for a coffee. Got my kindle back in 2011 pre touchscreen control. My navigation button has worn out! Love my Kindle, I always said I would never have one but now it goes everywhere with me. Would love a new one mine has just died On me !! I would love to win this , i love to read and especially on my holidays nit would be so convenient to take on holidays without having to carry books with you. Please write your comments here...I would love to win this prize as books are so bulky to take on holiday and when travelling. Wonderful! Normally I prefer paper books, but a Kindle would be much more handy for holidays when I could take as many books as I wanted to read! For the wife her Kindle screen slowly going Black! Would make a lovely Birthday present to myself !! Could do with one of these. The Reader sounds really good, especially as the battery life on my own reader seems not to hold its charge for long these days! Fingers crossed,this kindle would be a great prize. I have just joined a book club, so this prize would be just the job. Yes please, don't have an ereader. Brilliant for night time reading! I've never had the luxury of a Kindle so would appreciate being the lucky winner. Would love to win a new Kindle. I could then give my old kindle to one of my grandchildren. I use to read a lot but sadly work has gotten in the way I would love a kindle to take away with me on holiday and weekend breaks would get me back in to reading a lot more online problem was I couldn't put book down till I had finished it. I love my old kindle and have read hundreds of books using it but it is ten years d now so I would love to have the new Paperwhite. My old one is looking very sad now. To win this prize would be fantastic, as it nice and light, it would fit in your bag easily, as taking a book with you is rather bulky and heavy. Love my Kindle ,but it is not waterproof!! I do want that ! Would love the opportunity to win this fabulous prize. How lovely to be able to own one of these and lock myself away in books. Have had a kindle for quite a few years and it is well used. Would love an upgrade. Love the kindle Great for holidays! My Kindle Fire is getting old so this new version would be very much appreciated. This would be so useful on holiday. Off on once in a lifetime trip to Nashville and Texas in the autumn. This would make a great travelling companion! I love entering .competitions. Thank you for the chance. I’d really love one and would be great to carry out. When is the draw ? I could not find the date anywhere. Would love the chance to get my hands on a Kindle of my own, can't prise the old one from my wife. A great way to read and relax. I’d be able to read when I’m soaking in the bath! Now that would be handy. I usually read the book version, as I like to handle and feel it. But perhaps it is time to bring myself into the 21st century. Does not accept my entry. Problem? I love reading, what a great prize! I am trying to pass on my love of reading to my granddaughter and a kindle would make a wonderful gift for her. I cannot imagine life without my Kindle. At least when I fall asleep it won't hurt as much as a book hitting me on the nose ! A great idea to have the protection of water proofing so I can relax even more on holiday..
Would love to have a kindle paperwhite, it would be great for reading in bed and taking on holiday. Fingers crossed! Just the technology to re-'Kindle' my interest in literature ! As a disabled 86 year-old I currently find holding a real book quite tiring and my painful hands don't help! So having this up-to-the-minute Kindle would be a blessing. Fingers crossed to be a Winner! Would love this - so easy to read. Just the thing to help me relax. I would love to own a Kindle Paperwhite, fingers crossed! My Kindle is amazing but getting old now. Would love to win this smart new one. It would encourage me to read more. A great prize. Good lunch everyone! Love my kindle, but it’s very old. Soon will expire! It will be easier to hold in my arthritic hands. I hope to travel a lot with the Kindle I want to win! I was unable to enter the drawing. Why is it so difficult (if not impossible) to enter this "prize draw" ? This would be a fantastic prize to win and use on holidays. Never had a kindle - would love to try it. Just entered the prize draw found it so easy to enter. I personally love reading books on Kindle. I can pair it with Alexa, & she will read for me. Always goes back to the exact place, where you stopped reading. This will fill an empty space in my life, make up for company that I don't have. My old one has given up. So a nice new one would be fantastic. Good luck everyone! Would love one with a back light. Getting old, eyesight not what it was. Fingers crossed but I’m not usually lucky with prize winning. Great prize for an avid reader. Would love to enter but won’t complete when I press enter! I've fallen out of love with reading for a while. This will help me fall in love again. I'm now in a place ready to start again. My tablet no longer works so this would be great to have to use and read my digital books again. Would love to enter but won't complete after I push enter here! Ideal for the modern way of choosing, storing and accessing your chosen books. So much lighter to carry and lots of easy reading with the light...relaxing summer afternoons. I read a lot, got an old kindle but my eyes are struggling so one with a back light would be perfect. I would love a new kindle! I read so many books, I am runnhave NGOs out of shelves in my home! What better way is there to loosing oneself in a good book. Love to read! Would love to win a Kindle Ebook! Always wanted one. Wow, would love one of these. Would be a great addition to my suitcase or train journeys. I’ve owned a kindle for years as with arthritic hands I find it easier to hold. I really need a new one. This would be fantastic for my holiday. My last paperwhite has just broken after more than 1o years. I really miss it. I have never owned a kindle but do a lot of reading, so it would be ideal to be able to load books onto one item instead of having shelf loads gathering dust! Would be a great way to ensure I have enough books to read on holiday! Would be nice to win for once! Lol hope everyone has a lovely day! Anytime, anyplace, anywhere with a multitude of choice reading! Would love to have this. It would make a big difference to my having to pack books into my luggage for holidays. As I suffer with arthritis this would be such a boon for me as I enjoy a good thick book and they are getting more and more painful to hold. This being so light would be amazing. Would help on my flight to Oz!!!!! Would love to win this as have a very old Kobo which has a mind of its own ! It would be great to be able to read kindle in the bath! A new Kindle would be wonderful. I'd really appreciate the back lit screen during these dark winter days. As an avid ready since the age of four I have so many books in my house and will be downsizing to an apartment for our retirement and will be donating many books to charity. I won’t have space for many more books so I would love to own a kindle to continue with my passion for reading without taking up valuable space! This would be a lovely prize to win and not such a strain on the eyes. I read a lot so would love this prize! Would love to win this prize, great to take on holiday to read several books. Hundreds of books to hand and no airline weight problems...sorted! Would love to have a Kindle. Fabulous prize! Would love a Kindle to encourage me to read more. I would love a Paperwhite, going on a cruise later in the year and it would be brilliant, instead of taking heavy books with me. I'd stoke my reading passion with some kindle!! I would love to have a Kindle, so much easier than heavy books. I love reading and would love a kindle as my home is over run with books !! I'd love a new Kindle Paperwhite, my old Kindle has been used so much......a replacement would be great. My last kindle drowned in the pool on holiday, so this would be really handy. This would be much better than lugging books on holiday! Someone stole my kindle in transit, would love this! I had an original kindle then the kindle fire. Sadly, they have both given up on me. I have a tablet but it is quite heavy to hold for any length of time. I would love this as i'm an avid reader. Would love this, my present Kindle is as old as the trees we're trying to save by using a Kindle! Great bit of kit to have and very handy on the beach or along side a pool whilst on holiday. Definitely preferable to buying more books as I'm determined to reduce my paper footprint this year and save those trees! I've had a Kindle for many years, but really need an upgrade. thank you for the competition - fingers crossed. I love my kindle, and to win an updated version would be fabulous! Retiring soon and looking forward to having mor e time to read. So useful when traveling or going on holiday. Would be nice to replace my old kindle. I’ve just had an injury and can’t walk so this would be great! Would be great to have a library at hand to read . Be a pleasure to win such a prize, enjoy reading a great deal. I really need this as I belong to several book clubs and am running out of space to store my books. I am going on a long haul holiday in May and this would be brilliant. This would be great to win, but good luck to all who enter!! Having problems with my Kindle which I use every day as an avid reader. Would love to win a new Kindle Paperwhite. Sounds a great thing to own and not to have to take lots of books with you. Here's hoping, mine has just packed in. I don’t have a kindle so it would be fabulous to win one. Fingers crossed! My son bought me a kindle when they first came out. My Kindle is almost eight years old and I would love to update it. Since I now find reading of paper almost impossible but can read off my iPad since it is backlit and I can increase the font size easily it would be good to be able to have a Kindle for reading. I would love an "All new Kindle paperwhite". Current kindle is worn out.